Mr Mitchell said the early morning theme was "uplifting"
Two British MPs have tabled motions in the House of Commons criticising the BBC's decision to scrap the early morning UK Theme on Radio 4. The five-minute medley of English, Welsh, Scottish and Irish tunes will be replaced by a news bulletin. 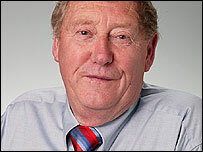 Tory MP Philip Davies and Labour MP John Spellar tabled motions with a third planned by Austin Mitchell. Station controller Mark Damazer has said he wants a better early news service for Radio 4. In his motion, Mr Davies said he regretted that "political correctness has sparked the removal of the UK medley" and claimed such political correctness was detrimental to patriotism. We need more nostalgia in this country not less! Mr Mitchell, the Labour MP for Great Grimsby, said: "I find it a very uplifting and interesting theme - it makes you feel good about life and the country." The theme, composed by Austrian-born Fritz Spiegl, is played each morning at 0530 to mark the start of Radio 4's broadcasts. It includes Danny Boy, What Shall We Do With The Drunken Sailor?, Scotland the Brave, Rule Britannia, Men of Harlech, Greensleeves, Londonderry Air and Early One Morning. Prime Minister Tony Blair was even urged at question time in the Commons to intervene on behalf of the theme. Tory MP James Clappison said: "Whether or not we are to have a Great Britain Day, will you at least do what you can do to help keep the UK Theme on early British morning radio?" Mr Blair joked: "Obviously, my influence with the BBC is legendary." He added: "But I know they will be aware of the very strong feeling that is expressed by you and by many others, I am sure, in the House and across the country." Mr Mitchell told the station's Today programme the BBC was "crazy" to want to drop the theme. "It's very cleverly welded together," he said. "For most people, it isn't an everyday experience. Each time it comes with a fresh joy, the shock of the new. It's lovely." Campaigner Tim Hatton, from Guildford, Surrey, had gathered over 4,600 signatures on his savetheradio4theme.co.uk website by 1200 GMT on Wednesday. "It's something that forms one of those idiosyncratic parts of what makes Radio 4 a great radio station," he told Today. "I appreciate Radio 4 has always changed but I am against change for change's sake - a lot of the comments I've had on the petition are aggrieved there doesn't seem to be any sort of consultation on this, it seems to be a done decision." Newsnight presenter Jeremy Paxman criticised the decision on his programme on Monday evening. "We've no idea what the head of Radio 4's playing at - we're thinking of using it every night," he told viewers, before the credits rolled to the theme. A BBC spokeswoman said Radio 4 had received about 100 complaints about the decision. "We hope that listeners will give the new schedule a try. This is not about political correctness, but about serving Radio 4 listeners the best way we can. "